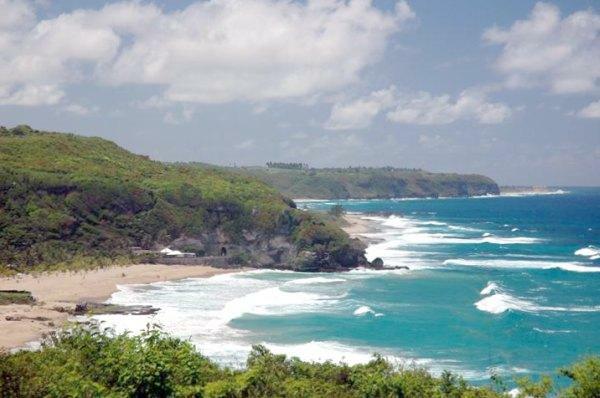 Close to Quebradillas, home to the Guajataca Forest in Puerto Rico, there’s Guajataca Beach. This is a surfers beach. If you’re not into surfing, you can still enjoy the beach. Guajataca Beach is perfect for tanning or strolling. And a tip – this beach is excellent for shelling! You’ll be amazed at the variety of nice shells found here. Get on the beach early, though. Because of the way the shoreline is angled into the ocean, waves bring up many shells that would normally flow along with offshore currents. This setting makes it perfect for things to wash up on shore for the taking. Of course you want to leave anything that is living. But you can find some real gems here at Guajataca. Now the name Guajataca comes from an Indian chief of the Taino tribe. He lived in this area and the beach. There is a lot of Guajataca here. For instance, there’s the Guajataca Forest, a preserve. In the preserve is a beautiful man-made reservoir named Guajataca Lake. It’s large and is popular in the area for fishing. There are some great bass here along with tilapia. Camping and hiking are also available in the preserve. So nice is it here at the lake, that the Boy Scouts of America have a large campground here. There’s a small river that flows from the reservoir to the Atlantic, and that’s where Guajataca Beach is located. The water is wild here, but the sand soft. To get to the beach, make sure you use the coastal trail. It’s so fun because you walk through an abandoned train tunnel! This railway used to take the sugarcane from along the coast to processing. It was so well built that hardly any work has been done throughout the years. Take the camera along. This is Puerto Rican history!